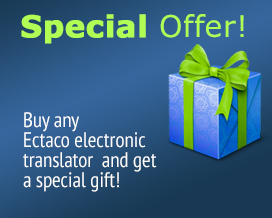 Buy ECTACO hi-end electronic translator and Accessory pack is yours as an additional bonus! Offers expire 23 April 2019! This week only! Offered at the lowest possible Holiday prices! Here you will find wide variety of linguistic software for the Pocket PC platform. Palm OS – The software applications here include dictionary software and variety of foreign-language learning tools for Palm OS. Here you will discover versatile and effective dictionary software along with practice and study aids and fun linguistic games. The software runs on Nokia and Sony Ericsson mobile phones. One or more of these quick-reference resources will surely become your go-to application in a variety of situations. Here, we are offering combinations of some of our best products. Each software collection is grouped by language or platform. There is plenty to choose from! Select the dictionary or translation software package that suites your needs best and let computers take care of the “dirty work”, our software packages give you the freedom you deserve! Software items cost less when purchased as part of a bundle, so it really pays to buy an all-in-one package.